1907 – Mr. Mangan of Pittston, PA breeds Sir Roger DeCoverly. Within a few years Sir Roger was winning both in the field and on the bench, and had developed a huge reputation as a grouse dog. Sir Roger DeCoverly was held to be the finest example of a Dual Setter in existence and the benchmark for “The Perfect Gentleman’s Shooting Dog”. 1967 – Ken and Nita Alexander become involved with the Setters and then the Ryman Kennels. Ken is given some premium Ryman breeding stock from Ellen & Carl, he then begins contract breeding for the Ryman kennels and eventually selling his own setters under the guidance of the Ryman Kennels. 1975 – The Ryman Kennels name is sold to Robert Sumner and Mr. Francis from West Virginia. 1977 – An unsuccessful attempt is made to join Alexander and Sumner’s operations and to build a new facility in West Virginia. The two go their separate ways, with Alexander forming DeCoverly Kennels. Sumner closes his kennel and the Ryman Kennel ceases to exist. Ellen suggested that Ken use the kennel name “DeCoverly” to imply to the public the transition of their support from Sumner to him. 1995 – Construction completed on a 20,000 square foot state of the art kennel in Lake Winola, PA. DeCoverly Kennels enters a new era. 2009 – Ken Alexander retires from DeCoverly after 40 of continuously developing the line. 2010 & Beyond – Bridget Bodine rejoins DeCoverly as Kennel Manager bringing a decade of DeCoverly work experience and 25 years of breeding and training knowledge. 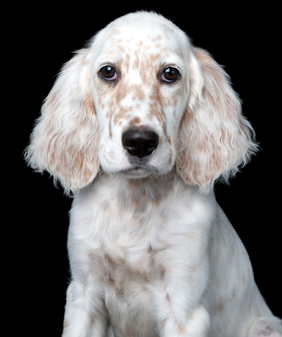 DeCoverly Kennels is poised to carry on its tradition of breeding and training fine English Setters.